What does a tea lover need to celebrate the holidays? 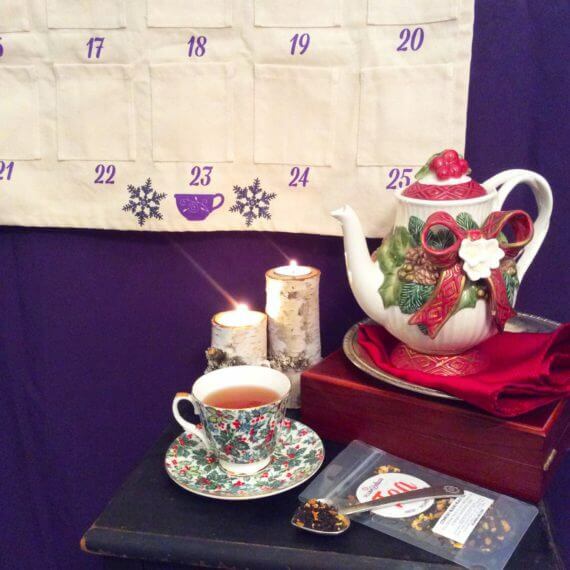 One of our tea lover’s advent calendar! We’ve handcrafted the advent calendar we know we’d love to have hanging by our fireplace. We started with a thick cream white cotton canvas background, sturdy enough so this keepsake will last years and years. The top and bottom of the canvas features a custom tea-themed design, screen printed using glittery blues and purples (which match almost all holiday decor!). The 25 pockets for your tea-time advent treats are hand-sewn and two grommets adorn the top for easy hanging – and the best part? The entire project was designed and assembled right here in Oregon. This year we have three options for your advent calendar purchase. You can mix and match the options to suit your own needs or gifting needs! 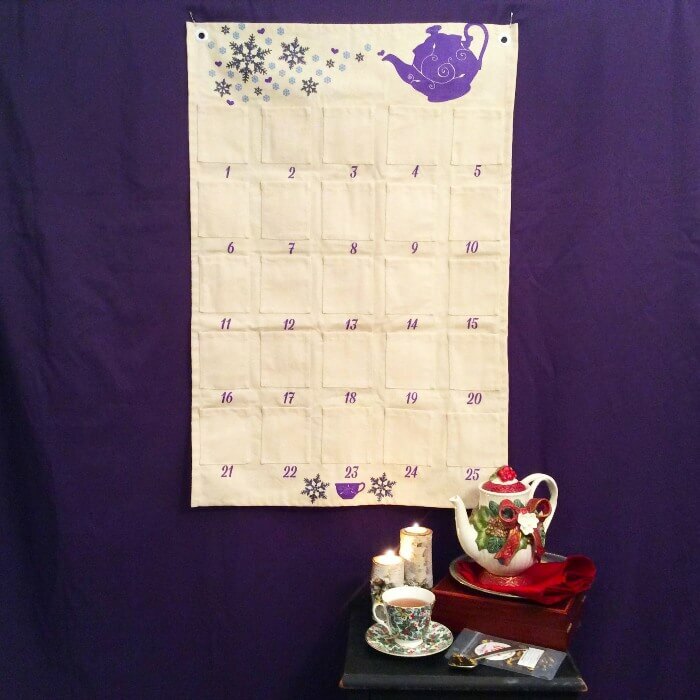 – The Fabric Advent Calendar with Treats: You can purchase our fabric calendar with treats for each pocket. ($100 )Sorry, these have sold out for this year! – Just the Advent Calendar Treats: If you already have our calendar from last year, or if you have your own calendar, you can just purchase the 25 treats to fill your calendars. ($27) Sorry, these have sold out for this year! Shipping Note: If you add a calendar option to your order, it will ship in the middle of November. We are aiming to ship the week of Thanksgiving so you have them with plenty of time for Dec 1st. These (and any items in an order containing an advent calendar) are shipping the week of Nov 19th, finishing shipments by Nov 23rd. If you haven’t received your calendar by Nov 29th, feel free to check in with us. I love the option to order the teas from the Advent calendar. The teas were delicious! I will definitely buy again next year! We gifted this advent calendar teas and treats to my mother in law as a combo get well soon / Christmas advent calendar present. She had broke. Her ankle and this was a nice way to count down to Christmas while she was healing up since she couldn’t get out and about. She has been marking her favorites and we will be ordering more in the future. My family and I had so much fun with this wonderful tea calendar. We looked forward to opening the packages each day. We will for sure be buying one again next year. I bought this as a gift for my dad. He enjoyed it! It was fun to see the different goodies in the packs. I love that they were still secret even though I didnt get the fancy wall hanging. It was a very unqiue gift! A fun way to taste a variety without buying too much of you end up not liking a flavor. It was truly delightful opening each envelope and trying a special treat each day. Dimensions: approx 2.25 ft wide by 3.75 tall. Individual pockets are 3in wide by 4in tall. Calendar with treats includes chocolate (gluten free/dairy free/vegan). The 25 treats are mostly 2-3 cup tea packets, but include a few non-tea treats. Enjoy the surprises. The teas include teas from our online shop as well as exclusive teas made just for the calendar. Unfortunately due to the complexity of creating these calendar kits, we cannot accommodate ingredient allergies or caffeine-free preferences.